Lexington, KY – May 15, 2014 – It has become a Thursday tradition to see Venezuela’s Pablo Barrios in the winner’s circle at the Kentucky Horse Shows, and today was no exception. The speedy rider once again topped the $25,000 Hagyard Lexington Classic, this time aboard the Romeo Group’s Romeo, while the ZL Group’s Zara Leandra settled for third. Todd Minikus slipped into the second place position with a quick and clear jump-off riding the Quality Group’s Quality Girl. Fifty-three competitors turned out for the second event in the Hagyard Challenge Series, but Michel Vaillancourt’s challenging track only yielded 11 clear rounds. The jump-off included three new fences, as well as double combination with a triple bar to vertical, followed by a short turn to a wide oxer. Emanuel Andrade set the original time to beat with a clear round on Hollow Creek’s ZZ-Top VH Schaarbroek Z in 41.830 seconds, which held up for sixth place. Callan Solem bested him with Horseshoe Trail Farm’s VDL Wizard in 40.752 seconds; Andrade’s second mount Hardrock Z was even better in a clear 40.106 seconds to have them finishing fifth and fourth, respectively. Pablo Barrios was the next rider to enter the Rolex Stadium at the Kentucky Horse Park. His top mare Zara Leandra is no stranger to laying down a blazing pace. They were right on the money despite a wide turn after the combination, and they went straight to the top of the leader board in 39.389 seconds. Todd Minikus did not let Barrios hold on to the lead for long though, making a smoother rollback after the combination with Quality Girl and dashing through the timers in 38.128 seconds to take over the top spot. Barrios was the last to return, this time with the ride on Romeo, and with nothing to lose he put the pedal to the metal. The pair galloped full speed at each obstacle, and they were able to turn even tighter inside after the combination. The risk paid off when they left each rail intact and zipped through the time timers in 37.525 seconds. Romeo led the victory gallop, while Quality Girl and Zara Leandra took home second and third, respectively. On Saturday night, riders will return to compete under the lights during $75,000 Mary Rena Murphy Grand Prix, sponsored by Audi of Lexington. Saturday will also feature the $20,000 Bluegrass Classic in the morning. 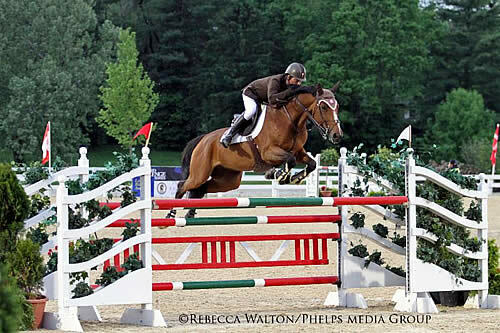 The jumper action at the Kentucky Spring Classic concludes on Sunday with the $10,000 Show Jumping Hall of Fame Junior and Amateur-Owner Show Jumping Hall of Fame Classics sponsored by Sleepy P Ranch & Audi of Lexington in the Rolex Stadium at the Kentucky Horse Park.